It’s summertime Toronto! And while there are many festivals being hosted this year, one of the most notable events (and one that shouldn’t be missed) is Toronto’s Caribbean Carnival. This year, the exciting street festival will be celebrating 50 years —50 beautiful years of shared cultures, music, costume, dance, and yummy Caribbean foods. Formally known as ‘Caribana,’ this Caribbean festival is one of the biggest events in North America with guests from the United States and various Caribbean islands. If you are unfamiliar with the culture of Carnival itself, traditions date back to the abolition of slavery on August 1 in 1834, in the British Caribbean territories. The first noted display of Carnival in the Caribbean was in the late 18th century, on the twin island Republic of Trinidad and Tobago. Trinidad’s Carnival is often held right before Lent on the Christian calendar, as the word Carnival itself means “farewell to meat”. To this day, Trinidad remains a focal point of Caribbean festivities, producing the catchiest Soca beats and featuring the most intricately designed costumes. However, most countries have moved away from the traditional Lenten celebration and have chosen to feature the festival during the summer months. These traditions have spread globally and have made a big impression in Toronto, a city already known for being culturally diverse. The Caribbean diaspora in Toronto also helps to keep the Toronto Caribbean Carnival season alive with locally-based costume designers that organize events for the public to play Mas in the streets. Some local costume designers and bands that will be displaying their work on the streets during this years festival include, Tribal Carnival , Carnival Nationz, Louis Saldenah, Toronto Revellers, and Venom Carnival just to name a few. In all, the festival stretches four weeks, with activities starting on July 7 and ending with the final event on Aug. 6. If you want a true, wild, and exciting taste of Carnival, the grand parade on August 5 will be the main highlight, as colourful bands, costumes, and joyful revellers take over the parade route along the Toronto Lakeshore. 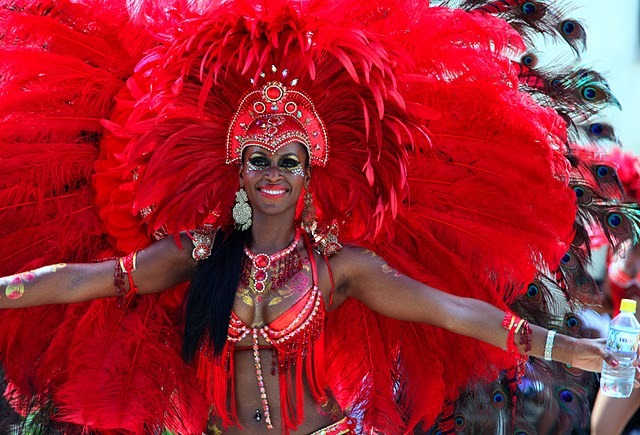 This may be overwhelming for some, but Women’s Post has five tips to help you enjoy your first Toronto Caribbean Carnival experience. Get a costume: Carefully plan and organize the Toronto Caribbean Carnival events you would like to participate in. If you want to play Mas in the streets with a registered band, you must buy one of the designated band costumes and follow their procedures. Paying and registering for a band is better than being a street ‘stormer’ crashing the party. Otherwise dance from the sidelines. Remember to hydrate, hydrate, hydrate ! This August is marked to be one of the hottest summer months in Toronto and partying in the sun for extended hours can be draining and dehydrating. Wear sunblock: It’s that simple. No matter your ethnicity. Monitor your belongings: The streets will be busy and if you will be dancing and having fun, keep the minimal and essential things you need close to your body. Have Fun! : Put your inhibitions aside for one day and party in the streets to lively Caribbean music, dance, move your hips and don’t be too shocked if a fellow party-er will come to give you a wine or two ( not the drink but an actual dance where you gyrate your hips ). Let us know how you are preparing for this year’s Carnival and leave some comments below. Enjoy the fetes !